I’m pleased to announce that commentary on Galatians in which I had a part has now been published. Marty Soards did a fantastic job on the biblical exegesis, and I provided supplemental materials to connect the message of Galatians to contemporary life for the sake of teachers and preachers who will strive to bring this important Pauline letter to life in the church. In his seventh letter to Lucilius, the philosopher Seneca observed that people learn while they teach. Perhaps it should be added that people learn a lot while they try to write biblical commentaries! 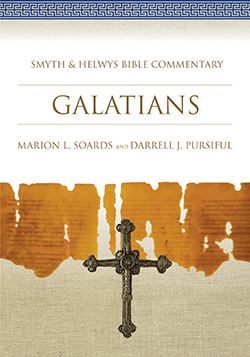 In their Galatian commentary, Soards and Pursiful present a fresh and comprehensive exposition of the epistle. They set forth a careful exegesis of the Greek text that is accomplished in clear language, easily understandable to the non-specialist. Although thoroughly acquainted with the best scholarship, they stick to the text itself and avoid the excessive speculation and over-emphasis on theology so characteristic of many Galatian commentaries. I rank this right at the top of commentaries I have read on Galatians. So, there you have it. Why not buy one for the whole family? When one has once put on Christ and, having been sent into the flame, glows with the ardor of the Holy Spirit, it is not apparent whether he is of gold or silver. As long as the heat takes over the mass in this way there is one fiery color, and all diversity of race, condition and body is taken away by such a garment. What are you doing, Paul, making common things your own, and claiming for yourself what was done on behalf of the whole world? For he says not “who loved us” but “who loved me.” … But Paul speaks in this highly personal voice, aware of the culpability of human nature and the ineffable compassion of Christ, aware of what he redeems us from and what grace he confers upon us. Burning with desire toward him, he utters this. In just this way did the prophets often make the universal God their own, crying, My God, my God, I invoke you. He shows that each of us ought to render as much thanks to Christ as though Christ had come for him alone. For God would not have withheld this gift even from one person. He has the same love for every individual as for the whole world. So, one of the reasons I haven’t been blogging as much lately is that I’ve been working working on the Galatians volume of the Smyth & Helwys Bible Commentary. Marion Soards has ably handled the exposition; I’m responsible for supplementary materials: sidebars, sermon/teaching ideas, and so forth. My deadline is still about a month away, so I’m still going to be fairly quiet around here, but I thought I’d repost a bit on the reception history of the Hagar story from Genesis that, you may know, figures prominently in Galatians 4. In chapter 1 of Reading the Bible with the Dead, John L. Thompson surveys the history of Christian interpretation of Hagar, Abraham’s wife-concubine whose story is told mainly in Genesis 16 and 21. Hagar enters the biblical narrative as Sarah’s Egyptian slave, forced to sleep with her husband Abraham in an ill-advised scheme to produce for him an heir. She is used, abused, and then cast out of the family when, after the birth of Isaac to Sarah, it was deemed she had outlived her usefulness. In Galatians 4, Paul used Hagar yet again—this time as an allegory for slavery to the Mosaic law. The “throw-away” sexual surrogate becomes a symbol of all that is second-rate in the economy of God. But such readings miss some amazing details of Hagar’s depiction in the book of Genesis, and Thompson credits feminist interpreters with bringing these details to light. Three observations and criticisms have registered with respect to Hagar’s story in Genesis. First, there is the concern “to recognize and recover the dignity, eminence, and even the exemplary character of Hagar” (15). Second, other feminist interpreters take an opposite approach by calling attention to what Hagar suffered and what this tells us about the character of Abraham (and Sarah). Finally, Hagar’s story has drawn attention to what may be called “the sins of the narrator” (16), the subtle clues in the text that betray the patriarchal biases of the storyteller himself, if not the Deity behind the action. After this brief introduction to the problems surrounding the Hagar narratives, Thompson raises the question to which many modern interpreters believe they already have the answer: Has the church forgotten Hagar? In fact, Thompson finds that interpreters of previous generations had long struggled with the disparities of these biblical texts—and often came to conclusions quite similar to those of modern feminists. In answer to the first concern, that of recognizing the positive dimensions of Hagar’s character, Thompson notes that there were, in fact, two strands of allegorical thought surrounding Hagar. The one in Galatians 4 we know, but ancient interpreters realized this was only one piece of the puzzle. For Philo of Alexandria, the symbolism of Hagar was the “preliminary teachings” that the wise must study on their way to true wisdom (symbolized by Sarah). For Origen as well, Hagar does not represent a literal wife or a fleshly union, “but rather the virtue of wisdom” (19). Abraham thus did not take on a second wife, but a second virtue. Her expulsion from Abraham’s camp provides a contrast between the meager skin of water with which she is provided and the divine spring she discovers in the wilderness. She is thus like the Samaritan woman of John 4: “both had their eyes opened to see a well of living water, which in each case was Jesus Christ” (19). Later patristic interpreters likewise found in Hagar some symbol of godly virtues. For Didymus the Blind, Hagar could only symbolize these virtues because, as a historical person, she possessed them in a literal way, “as evidenced by her good behavior and her worthiness to receive heavenly visitations” (19). He even invokes Matthew 5:8, “Blessed are the pure in heart, for they shall see God,” to argue that, since she had a divine vision, Hagar must have been pure in heart. In all of the patristic era, Augustine is virtually alone in attributing purely negative characteristics to Hagar. For him, she is a figure of heresy. Into the medieval period, the church’s assessment owes more to Origen and Didymus than to the bishop of Hippo. Nor does the early church let Abraham off the hook for his despicable treatment of Hagar. The earliest worries about Abraham expelling Hagar and her son Ishmael come from the rabbis. In Genesis Rabbah, there is great interest in the meaning of the Hebrew term in Genesis 21:9 where Ishmael is “playing” with Isaac. For the rabbis, this term was associated with shameful deeds—”fornication, or idolatry, or attempted homicide” (23). Whether these speculations are true, it must be said that they apparently arose out of a sense of discomfort with Abraham’s seeming extreme reaction against Ishmael’s otherwise innocent behavior. The disparity between Ishmael’s “crime” and the “punishment” inflicted by Abraham captured the attention of Christian writers as well. John Chrysostom “attributes great reservations to Abraham over the severity and oppressiveness of Sarah’s plan to evice Hagar and Ishmael. A few years later, preaching on Galatians, he makes some similar moves, arguing that only the stirrings of divine providence can account for this event, for otherwise the penalty would be vastly more serious than Ishmael’s brashness warranted” (23). None of these precritical interpreters intended to hang Abraham without a trial. On the contrary, they strove to find a way to harmonize the actions of the biblical characters with the moral standards they learned in Christ. But as Thompson notes, “If some [commentators] appear to have worked overtime to exonerate Abraham, they never lost sight of the seriousness of the charge against the patriarch nor brushed aside the terror inflicted on Hagar and her son” (25-26). What then about the “sins of the narrator” in how Hagar’s story is told? Feminist interpreters charge that traditional, patriarchal exegesis has locked Hagar into “a petty and stereotypical role” (26) and whitewashed the injustices committed against her. But Thompson argues the history of exegesis of these passages does not quite fit this billing. “They are admittedly patriarchal, albeit in an unconscious way,” Thompson argues, “and they are capable of succumbing to gender stereotyping, but they show a surprising tendency to rise above these traits in pursuit not only of ‘literal’ exegesis but also in defense of Hagar” (26). Again, Thompson surveys numerous commentators, this time from the Reformation era. Zwingli, Pellican, Musculus, and Luther all characterize Hagar as a humble, pious woman, despite the culturally bound gender stereotypes within which they worked. Musculus in particular believed Hagar had every reason to complain of her treatment. He even admits that “Hagar would not have sinned had she voiced some of her complaints. AFter all, Job and Jeremiah offered laments, and even Christ cried out fromthe cross, ‘My God, my God, why have you forsaken me?’” (27). Luther could even speak of the godliness of “saintly Hagar” (28) and ponder how her experience is a figure of the Christian path from humiliation to faith and repentance. Hagar is Important. Any incursion into the patriarchal narratives that treats Hagar as the lectionary has mostly done, excising the dubious deeds of Abraham as well as Hagar’s own triumphs and travails, is at once a betrayal of the integrity of the biblical text and the squandering of a rich homiletical opportunity. Hagar’s Story Is Terrifying. Nothing is gained by “reading for the center” so as to pretend that Hagar’s misfortunes did not happen or that they weren’t so bad after all, given the happy ending that came her way. Hagar Is More than a Symbol. Despite the precedent offered by Paul’s allegory of Hagar as a figure or type of those who foolishly sought justification through the law, Galatians 4 should not erase or upstage the compelling portrait of Hagar in Genesis. Hagar Is Connected to Us by Our Own Tradition. If it is dysfunctional to ignore Scripture’s silences, it is hardly better for preachers to suppose they can fix the Bible alone, by exercising their own authority or creativity. Instead, congregations ought to be reconnected to Christian tradition by being reminded of the witness of past interpreters. A final note: Thompson covers vast swaths of history of interpretation in only a few pages. While at one level I would have preferred more extensive quotation from the primary sources, I appreciate that this would make the book large and unwieldy. He provides a 28-page “Finding Guide” at the back, broken down by biblical book, of the major historical interpreters whose works are currently available in English. Readers who want to check Thompson’s citations and do additional research are thus armed for the task. The look on Mr. Chopra’s face is priceless. I’m not sure he knew what had just happened. Some streams of contemporary thought insist that there are no absolute truths—absolutely none! What is true for me is true for me, but that doesn’t mean it has to be true for you. Obviously, if all truth is relative, none of us should get overly concerned about people who believe differently. In this worldview, a document like Paul’s letter to the Galatians must seem at best like primitive superstition (a “coverup for insecurity” in Deepak Chopra’s words) and nasty hatemongering at worst. Paul believed the gospel was worth fighting for. It was not something he had made up or received through faulty human tradition; it was a revelation from God. It was not just “true for him”; it was true, period. And because it was true, he was furious that the Galatian Christians had abandoned it for external piety and warmed-over legalism. At the same time, Galatians poses a challenge for those of us who do not embrace our culture’s absolute relativism (I know that’s a logical contradiction, but I gotta call ’em like I see ’em). Paul was contending for the gospel. He was not contending for a particular end-times scenario, style of worship, leadership structure, or pet doctrinal position. He was willing to fight for the central defining tenets of the Christian faith—the saving work of Christ and justification by faith alone—but he did not confuse the core gospel message with secondary matters. Yes, there are absolute truths that we can know and must confess and for which we should fight…but there are only a few. Again, Thompson surveys numerous commentators, this time from the Reformation era. Zwingli, Pellican, Musculus, and Luther all characterize Hagar as a humble, pious woman, despite the culturally bound gender stereotypes within which they worked. Musculus in particular believed Hagar had every reason to complain of her treatment. He even admits that “Hagar would not have sinned had she voiced some of her complaints. AFter all, Job and Jeremiah offered laments, and even Christ cried out fromthe cross, ‘My God, my God, why have you forsaken me? '” (27). Luther could even speak of the godliness of “saintly Hagar” (28) and ponder how her experience is a figure of the Christian path from humiliation to faith and repentance.